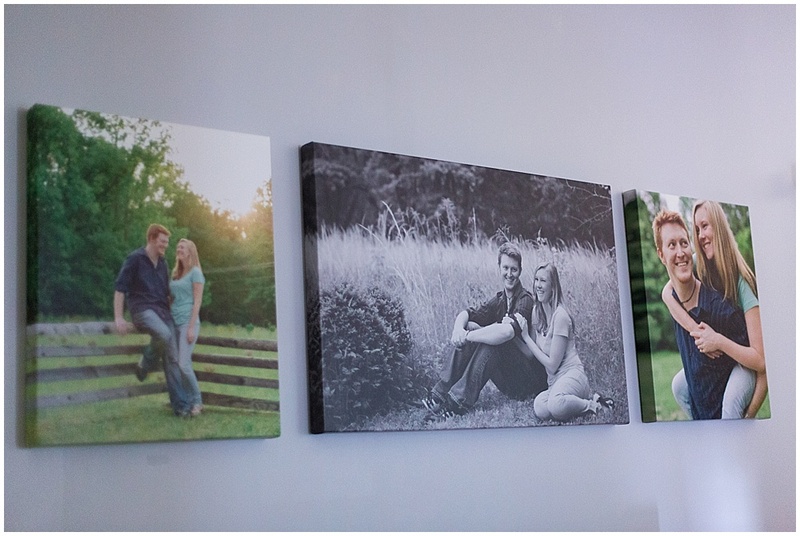 Once upon a time I wrote this post about how to order a wrapped canvas. It was swell and I explained my process of choosing photos from the anniversary session Erik and I did with my talented friend, Stephanie Dennehy. Then I ended that post by saying, "I'll post a picture when it's all done!" So while I was eating my oatmeal and drinking my coffee on the sofa this morning I was staring at my lovely canvases, basking in their beautiful glow, and I had that lightbulb moment where I realized it's probably about time to share with the world. They turned out super gorgeous. Perfect colors and textures. For anyone wondering, the size dimensions of the outside two are 16x20, the middle is 20x30. I know a lot of people look at 20x30 on paper and think OHMIGAWD that's huge! But it's not! 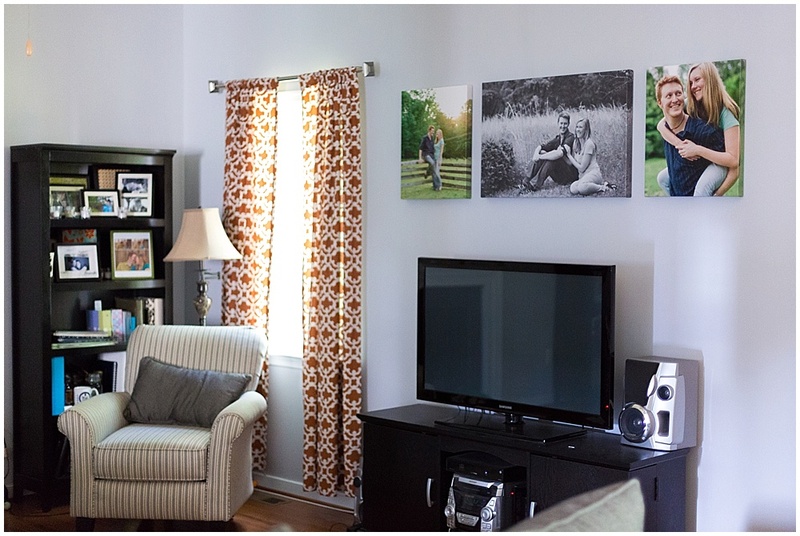 You have to think about the space you're filling on your wall. The 20x30 up on the wall alone would have looked tiny! It needed friends. I am thrilled with how it turned out. I used the same professional lab that I use to print my clients' canvases because I REALLY think they're the best. Gorgeous, high quality canvases. Erik mocks me because I cover the walls with images of ourselves and perhaps some people would misconstrue this as some narcissistic obsession. But hey I'm just practicing what I preach and I really feel that if you take the time to have professional photos done (which duh you should!) 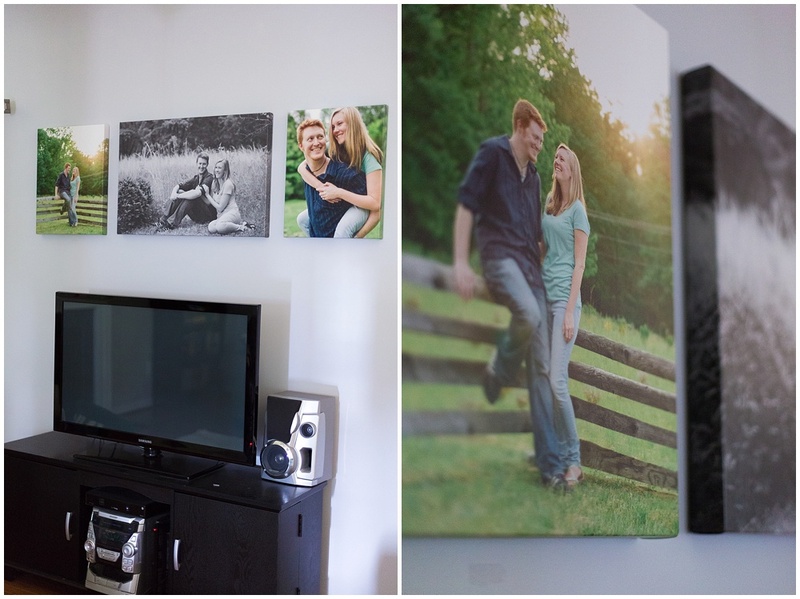 then you need to print those images in a way that you can enjoy them - canvases, framed, albums, whatever makes you happy. More on beautiful photo products to come. I've discovered some new products that I'm falling head over heels for and think my wedding clients will absolutely ADORE. Stay tuned!